We are all creatures of habit, at some capacity. NPR is the soundtrack for my morning commute. After numbing my mind a bit by pulling my morning reports at work I find my solace in reading international, national, and local news. I’ve come accustomed to seeing any and everything Occupy as a headline. 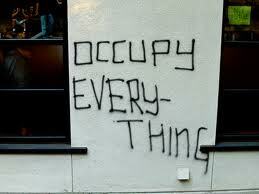 In fact, it has become common practice to capitalize Occupy as it is no longer a verb, but has evolved into proper noun. Heck, even Miley Cyrus and Occupy made newsrecently! Being transparent, I must admit that my eyes gloss over a bit every time I see an Occupy story because the media is reporting so much that it is overwhelming. Frequency breeds inattention in this case for sure. Rather than allow myself to hold onto any opinions I may have without treading through the vehement seas of the news media I decided to reach out to those actually involved to get there thoughts on a couple questions that I thought would be helpful to me and maybe even others. I had the good fortune of meeting two ladies involved in different Occupy camps, one Oakland and the other Indianapolis. Camile Graves is involved in the Occupy Oakland movement and most recently had her pretty picture taken by the media after being arrested. I was excited to get to hear from her after her brother and my good friend, Ryan Graves gave me her contact info. Leeza Faziolo was referred to me by a mutual friend (and great musician), Steven Cooley and she is involved in the Occupy Indianapolis camp. I’ll be posting a question and answer from both these ladies for the next 5 days on my blog in hopes to offer some clarity for those of us fed up with trying to drink water out of a firehouse when it comes to the news coverage of Occupy. Please feel free to comment and send some additional questions as they have both expressed interest and been kind enough to take on additional questions. Enjoy! 1. What is the ultimate measure of success the Occupy Movement would achieve? If it could achieve everything it wants what would that look like? Is there an ultimate goal? First off, I can only speak for myself; I am not a spokesperson. But in my own words I believe this movement is very insightful and we understand we are in our infancy. We’re coming together to say something is terribly wrong in our country. Some have specific suggestions for how it can be made right, but for the most part people are not giving out concrete demands because the truth is were figuring it out, together, which is in essence the true spirit of democracy. I have heard members argue this is not a protest, but rather, a process. The movement is still evolving and when the time comes for the specifics they will be known. To draw a picture of what things will look like is a bit premature. I see the end result as the ceasing of oppression and marginalization of our people. The end result would be a change of the system which favors the hegemonic class. I would like to see corporations pay their fair share of taxes and hold them better accountable, for banks to be better regulated and a drastic change in how lobbying is done in our country. I can’t say what the ultimate measure of success will be, but if the movement were to cease in this instant, it has already been wildly successful. Awareness has been raised into the gross inequality in our country and the disappearing middle class, and citizens have joined together in working groups to set up medical tents, to feed and shelter our homeless, provide legal groups to teach citizens their rights, education groups to keep the public informed etc. That is the success has looked like thus far in the Occupy Wall Street movement. Not to mention the social responsibility individuals have taken on with this new found knowledge. 1. You were involved in Occupy Oakland right? Yup, I've been involved with Occupy Oakland for almost a month now. At first I was skeptical, but I went to the camp out of curiosity and was surprised to find a lot of really friendly, passionate people. I was also really impressed by the voting and consensus process, which is our way of getting everyone's input on planning and organizing events and directions the movement should take.